Argentine Economy Minister Nicolás Dujovne was in Washington last week for talks at the International Monetary Fund as his country is seeking early disbursements of a $50billion standby loan. 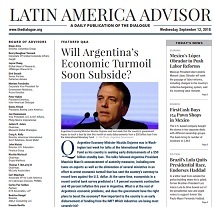 The talks followed Argentine President Mauricio Macri’s announcement of austerity measures, including new taxes on exports as well as the elimination of several ministries in an effort to arrest economic turmoil that has sent the country’s currency to record lows against the U.S. dollar. At the same time, economists in a recent central bank survey predicted a 1.9 percent economic contraction and 40 percent inflation this year in Argentina. What is at the root of Argentina’s economic problems, and does the government have the right plans to boost the economy? How important to the country is an early disbursement of funding from the IMF? Which industries are being most severely hit?